Johann Christian Credius was organist and concertmaster in Halberstadt and Blankenburg. 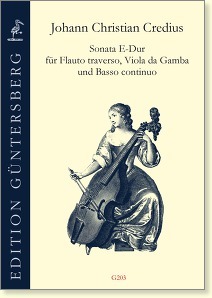 This sonata was probably written in Blankenburg before 1720, and later found its way to Stuttgart. The kind of composition is similar to that of Telemann. 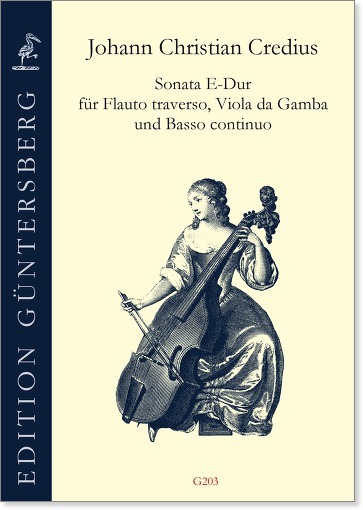 – There are not very many trio sonatas for flute and viol from this period, with the exception of those by Telemann. Therefore, we assume that this cheerful and – in spite of the key of E Major – not particularly difficult piece will find acceptance by professional musicians and amateurs alike as a welcome addition to the repertoire.